Your custom invitations and announcements have been designed to reflect the appropriate event type and tone, and your envelop should echo the same idea. Whether you’re planning a scholarship luncheon, a promotional business conference, a grand opening, or the launch party for a new product or service, your announcement envelop should communicate the appropriate event tone and, of course, keep your invitation or announcement from being tossed out! Academic donors think and behave differently than tech product bloggers, and should be addressed accordingly. You know who your customers and clients are, and have designed your invitations to reflect their principles, desires and needs. 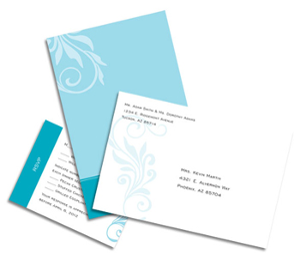 Don’t forget to incorporate the same line of thinking into the design of your custom envelopes. Type font, text size, layout and color should match the tone of what’s important to the recipient. While brightly-colored envelopes undoubtedly stand out against a gray and white mass in someone’s mailbox, it’s important to utilize colors and textures that compliment the current season. Just like you wouldn’t wear a thick, dark red, cable-knit sweater to a barbecue in July, you should avoid sending invitations and announcements in envelopes that’s color, weight and texture harshly contrast the season. Brightly-colored envelopes made from light-weight paper are better suited for spring and summer months, and for more relaxed events. Conversely, darker envelopes, heavy print, and thick paper are more appropriate for fall and winter months, and for more formal events. The branding of your company or organization was developed to communicate a certain tone and message. Whether that message is fun and casual, or seriously professional, it’s imperative that it translates to your mailed materials. Your desired business image is likely what you’re trying to strengthen by holding your announced event, so make sure that the envelop doesn’t detract from or offend what you’ve worked to communicate thus far. Picking or designing an announcement envelop doesn’t need to take a ton of extra time, but by devoting a few extra minutes to selecting the right paper, size, color, font, text weight and layout, you’ll ensure that your announcement is delivered and received in the very best way!